We're shipping more and more dollars overseas to buy oil and fund war [and many other things]. The dollars are finding their way back. Some are buying products that can be exported. Others are buying bonds, stocks, buildings and non-exportable assets. Others are buying bonds, stocks, buildings and non-exportable assets. [Mr. Burns voice]: Excellent - the plan comes to fruition. That's how we suckered the Japanese in the 80s. I can't even count how many investment bankers I've heard talk about getting a "foreign buyer". It generally means top dollar for the company with easy deal terms. Considering how much our currency has dropped in value, this is actually a piss poor performance. In the last 8 years alone, we have gone up 20% on a importation of oil on a BARREL basis, now multiply this by the increase in a cost per barrel. Show me our growth of exports with our growth of imports and then you have information. This is just data. 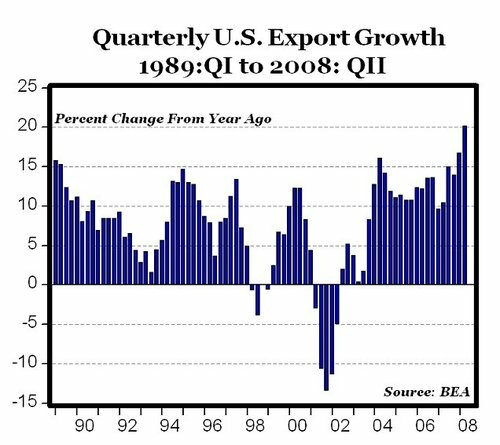 20% year on year export growth isn't good enough for you (Q1 2007 to Q1 2008)? Personally I think it's impressive. I figured that US exports would eventually respond to the drop in the currency, but the speed of the reaction in an economy so large is really something.